Tue., 29 Oct. - Thu., 14 Nov. Tue., 12 Nov. - Wed., 27 Nov.
Fri., 8 Nov. - Mon., 25 Nov.
Fri., 8 Nov. - Sun., 24 Nov. Sun., 3 Nov. - Sat., 23 Nov. Tue., 29 Oct. - Fri., 15 Nov. Tue., 5 Nov. - Mon., 18 Nov. Tue., 17 Sep. - Thu., 3 Oct. Tue., 3 Sep. - Tue., 24 Sep. Tue., 22 Oct. - Wed., 30 Oct. Tue., 10 Sep. - Thu., 26 Sep.
Wed., 6 Nov. - Tue., 19 Nov. Tue., 21 May - Wed., 5 Jun. Wed., 6 Nov. - Mon., 18 Nov.
Wed., 20 Nov. - Wed., 26 Feb. Mon., 23 Sep. - Wed., 30 Oct. Mon., 3 Feb. - Thu., 27 Feb. Tue., 17 Dec. - Tue., 7 Jan.
See all 643 properties in Auckland Intl. 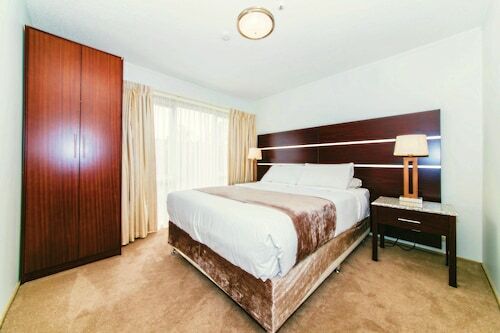 Situated in Mangere, this luxury hotel is 0.8 mi (1.3 km) from Butterfly Creek and 3.1 mi (5 km) from Villa Maria Estate. Rainbow's End and Otuataua Stonefields are also within 6 mi (10 km). Situated near the airport, this luxury hotel is within 12 mi (20 km) of Rainbow's End, Mt. Smart Stadium, and Sylvia Park. Auckland War Memorial Museum and Eden Park are also within 12 mi (20 km). 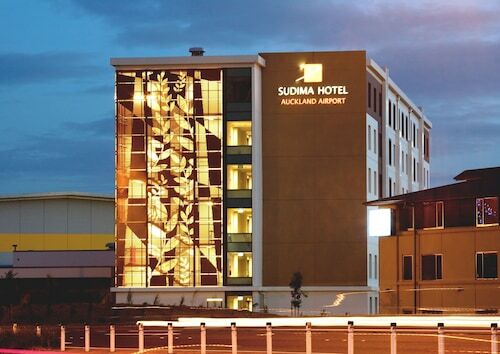 Situated near the airport, this luxury hotel is within 3 mi (5 km) of Villa Maria Estate, Otuataua Stonefields, and Ambury Regional Park. Butterfly Creek is 2.8 mi (4.6 km) away. 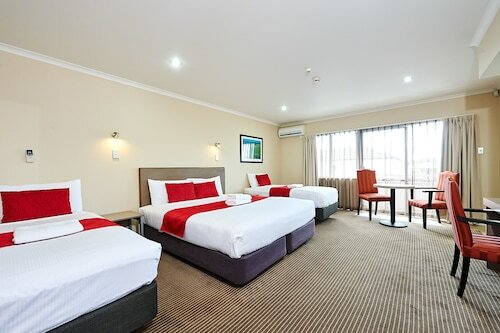 This family-friendly Mangere hotel is located near the airport, within 3 mi (5 km) of Butterfly Creek, Villa Maria Estate and Crater Hill. Otuataua Stonefields is 3 mi (4.8 km) away. 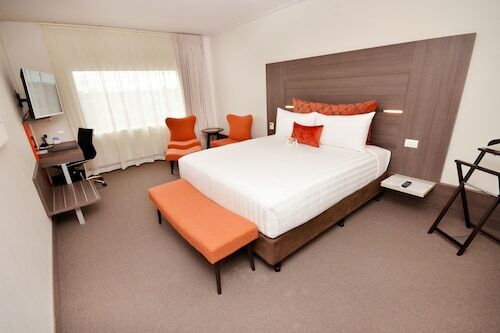 The Heartland Hotel Auckland Airport is in the Airpark Business Center, a 5-minute drive from the airport - the hotel provides a 24-hour terminal shuttle service. 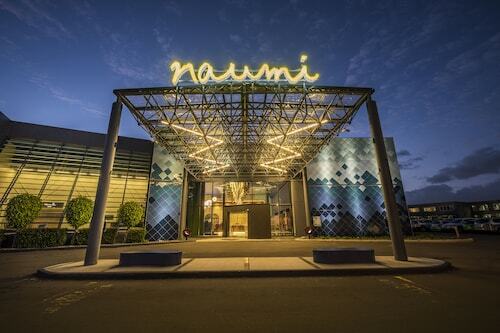 Manukau City is 12 minutes’ drive away, and the trip into the center of Auckland takes around 20 minutes. 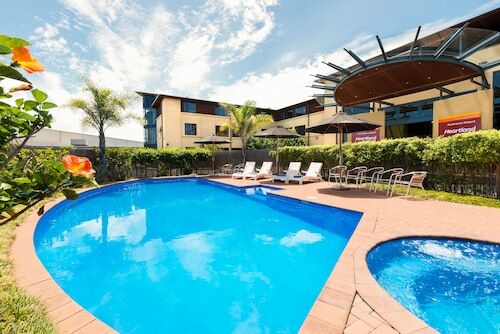 Situated in Mangere, this motel is within 3 mi (5 km) of Villa Maria Estate, Butterfly Creek, and Otuataua Stonefields. Rainbow's End and Ambury Regional Park are also within 6 mi (10 km). Situated near the airport, this hotel is within 3 mi (5 km) of Villa Maria Estate, Otuataua Stonefields, and Butterfly Creek. Ambury Regional Park is 2.8 mi (4.5 km) away. Answer : Yes, you can switch your departure or arrival date. If you want to save a little cash in doing so, the lowest-cost day to fly in April is Thursday. Having flexibility in your travel plans means you can save more, so be sure to plan ahead when possible. Question : What airports do you fly into for Auckland? Answer : Lucky for you, there is a less expensive way to get to Auckland from Vancouver. Victoria International Airport (YYJ) is 40 miles away from Vancouver International Airport, and over the next two months, flights are being booked 56% cheaper than flights from Vancouver International Airport. Question : How long is the flight from YVR to AKL? Answer : This direct flight will take you away to your destination in 14 hours via Air New Zealand. If you catch the 6:40 PM PDT departure, you'll arrive at 5:40 AM NZST. You'll have plenty of time to grab a quick lunch before your upcoming rendezvous (don't forget, there is a 21 hours time difference). Question : What is the cheapest date to fly to Auckland? Answer : As of Apr 15th, the best day for booking to Auckland (AKL) is Apr 20th. A ticket will put you out $1,018, which is 37% below the average price to book the same route. Question : Which airline has the least delays from Vancouver to Auckland? Answer : Air New Zealand leads the way with a 92% on-time rate. Spend as little time in an airport as you need to by flying with Air New Zealand. Note that if they do have a delay, it usually lasts about 33 minutes. Question : How long do most people stay on their visit to Auckland on average? Answer : Of course, you're not most people, but if you were, you'd stay roughly two weeks. Answer : The cheapest day to fly from Vancouver to Auckland is on Thursday. If you would like to save some money on your next holiday look for flights on Thursday.